San Francisco is something of a pedestrian paradise. It was voted one of the most Walkable Cities in The United States just a couple of years ago and features well-maintained pedestrian walkways, staircases (where necessary), and tons of shaded green space when the California sun gets a little too hot. But you’re not just walking around an urban metropolis—you’re walking around a gorgeous seaside village! This modern city still retains a great deal of its turn-of-the-last-century charm. The views from across San Francisco aren’t cluttered by ultra-sleek glass and steel structures (except for the Financial District). They really maintain a connection with nature that a lot of American cities have lost (and are trying desperately to get back). Whether you live here or are only visiting for a few days, you owe it to yourself to get out and really experience this unique City by the Bay the old fashioned way: on foot. To start you off on your pedestrian exploration, here are the 7 best views in San Francisco. This iconic 201-foot-tall concrete landmark looks like some Art Deco monument plucked right out of the heart of Italy. It was constructed in 1931 as a memorial to Lillian Coit, a well-known philanthropist who decreed that 1/3 of her sizeable estate be dedicated to beautifying her beloved San Francisco. The observation deck affords unobstructed 360-degree views of the entire city from The Bay Bridge across The Financial District to the Golden Gate and Alcatraz beyond. It’s also a bargain for tourists at just $7 per visitor. Hiking to the top lets visitors gaze down upon San Francisco from on high—roughly 900 feet high. Located near the geographical center of San Francisco, these hills have a long and storied history from the time of indigenous tribes right through to today. One of the best vantage points is Christmas Tree Point (roughly 70 feet below the tip of North Peak). From here you can see the city and the bay and Santa Ana Mountain to the south (on a clear day). You’ve probably seen the view from this city park thousands of times and may not have even known it! It’s featured in the opening sequence of Full House and the pastel houses decorated with ginger breading and multicolored roofs are where we’re led to believe the Tanner Family lived. Even if you’re not a TV buff Alamo Square offers a wonderful view of San Francisco’s financial district towering above these quaint turn-of-the-century Victorian homes. For those of us who enjoy a little people watching, Mission Dolores Park is almost 16 acres of Heaven. One of the city’s most popular parks, it’s a great place for a picnic or a stopover on your walking tour of San Francisco. It once served as a refugee camp for survivors of the Great 1906 Earthquake but now, it’s a natural oasis. You’ll enjoy green lawns shaded by palms, sports courts, and two dog parks. Mission Dolores Park is also host to a number of festivals and cultural events throughout the year so check the calendar. What trip to San Francisco would be complete without a stroll around the grounds and facilities at this historic prison? Take the ferry across and visit the temporary home of famous (and infamous) criminals like Al Capone, Machine Gun Kelly, and the Birdman of Alcatraz. But while you’re there, don’t forget to look up. Alcatraz sits right in the middle of San Francisco Bay so you can see pretty much everything from there. San Francisco’s cable cars are every bit as iconic as The Golden Gate Bridge. The Powell-Hyde line offers some spectacular views as well and delivers you right to Fisherman’s Wharf. Along the way you’ll fly down Hyde (between chestnut and Bay Streets) along the steepest stretch of cable car rail in the whole Muni system. On a clear day you can see out into the bay and spot The Golden Gate and Alcatraz as the wind whips through your hair. Exploring San Francisco on foot is truly a memory-maker. But be careful. Failure to yield collisions are one of the most common pedestrian accidents in San Francisco—so be extra wary at crosswalks! 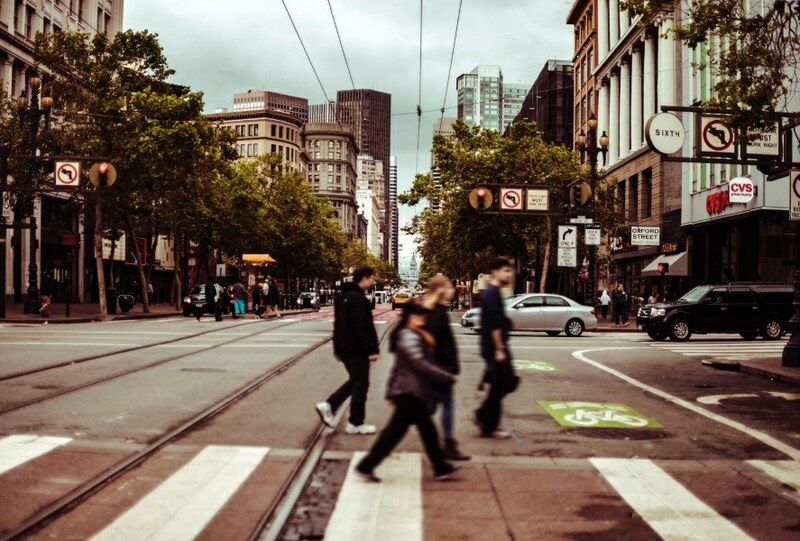 And if you are injured, fill out this short form to see if you have a case or contact an expert San Francisco pedestrian accident attorney—call (415) 413-0033 today.